After her divorce, 40-something Eleanor decides it is time to begin again. She leaves behind her busy London life, and moves to a quiet seaside town in Devon. There she opens up a bookshop, The Reading Room, on the local high street and makes quite a success of it. But can Eleanor make a success of her love life as well? When her sister suggests they take a trip to the South of France to track down her gorgeous ex, Eleanor leaves her beloved shop and lime-green camper van in the care of an eccentric cast of friends and family, and hits the road. Will she discover what happened to her great love, Christophe? Does Eleanor's heart still belong in France? Or is there something, or someone, she's been missing in Devon? I kindly received An Unexpected Affair in exchange of an honest review by the author. It was three years since Eleanor Mace had left her boring office job and caused her friends’ collective jaws to drop by announcing that she was leaving busy London and moving to beautiful Devon where she had bought the bookshop called The Reading Room which turned out to be a huge success. Eleanor thought how lucky she was in her new life. And so she was, most of the time. But, sometimes she did think that it might be nice to have someone to share things with again. When her sister Jenna suggests they take a trip to the South of France to track down her gorgeous ex Christophe, Eleanor leaves her beloved bookshop and hits the road. What will await them on their journey? Will Eleanor discover her feelings for her old love again or is there someone, she's been missing in Devon? An Unexpected Affair is the second novella I read by Jan Ellis. I highly enjoyed French Kisses that's why I was looking forward to giving this one a go. 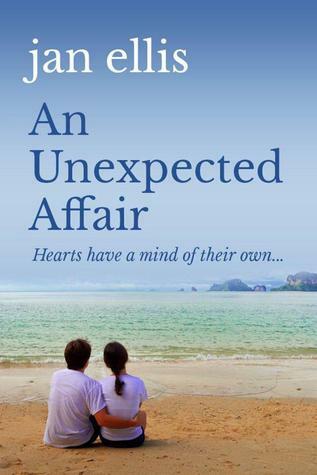 An Unexpected Affair was a nice, quick read that I found easy to lose myself in. Ellis writing is charming, beautiful and easy to follow. We are spoilt for instantly-likeable characters in this novella. I was instantly taken by Eleanor and the wonderful range of side characters. Ellis made it possible that I cared for her characters in less than 100 pages. I love stories where bookshops are inclueded. In An Unexpected Affair Ellis has done it very nicely. I could totally picture the place complete with the cozy reading space and all the lovely, fluttering books. Books are meant to be treasured and Eleanor's shop brings them wonderful new homes. It is not a story full of twists and turns, I went with the flow and enjoyed the smooth, peaceful story, full of beautiful weather, beautiful settings, beautiful people a little bit of romance. Told in a very charming, sweet way, I have actually felt emotions in Ellis word. Sadly the story did end quite quickly and I was left wanting more. Fortuately Eleanory story is not over yet. I'm looking forward to Ellis new release A Summer of Surprises, which is a follw-up to this novella, so I can find out what happens next. I personally class this as a perfect summer read. Get a glass of wine and enjoy this lovable reading, you won't regret it.